You can analyze recurrence data when the recurrence ages are grouped into intervals, instead of being exact ages. Figure 12.38 shows a listing of a SAS data set containing field data on replacements of defrost controls in 22,914 refrigerators, whose ages are grouped by months in service. Nelson (2002, problem 5.2, chapter 5) presents these data. Grouping the control data on the 22,914 refrigerators into age intervals enables you to represent the data by 29 data records, instead of requiring a single data record for each refrigerator, as required for exact recurrence data. 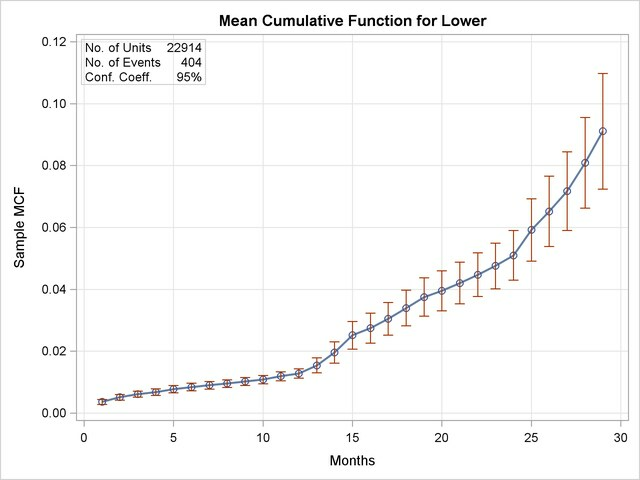 The variables Lower and Upper are the lower and upper monthly interval endpoints, Recurrences is the number of defrost control replacements in each month, and Censored is the number of refrigerator histories censored in each month—that is, the number with current age in the monthly interval. Data are entered as shown in Figure 12.38. Pointwise confidence limits are included on the plot and in the tabular listing. These limits are approximate, and are usually shorter than the correct limits, which have not been developed for interval data. Here, INTERVAL = LOWER UPPER specifies the input data set variables Lower and Upper as the age interval endpoints. The variable Recurrences identifies the number of recurrences (defrost control replacements) in each time interval, and Censored identifies the number of units censored in each interval (number in an age interval or removed from the sample in an age interval). * The estimate and limits for this interval may not be appropriate. The last interval is always marked with a footnote indicating that estimates for the last interval may be biased since censoring ages often are not uniformly spread over that interval.